Management support system uses the information resource which helps to manage the information for planning and decision making. Information provided by the internal and external data system. By these information is help to achieve the goal of organization. Management support system is a process for store, retrieve, evaluate the information and make a frame work planning, performance, controls, financial, personal information, and production. Management support system is computer based system which helps manager in an organization. in organization system transfer the information by the various way for grow the productivity with the manager style . in management support system should avoid the duplicity of information gathering. These particular systems give information to direct the people for making decisions and planning in the organisation. With the help of this system the manager fulfil the information support for making effective decision in organization. 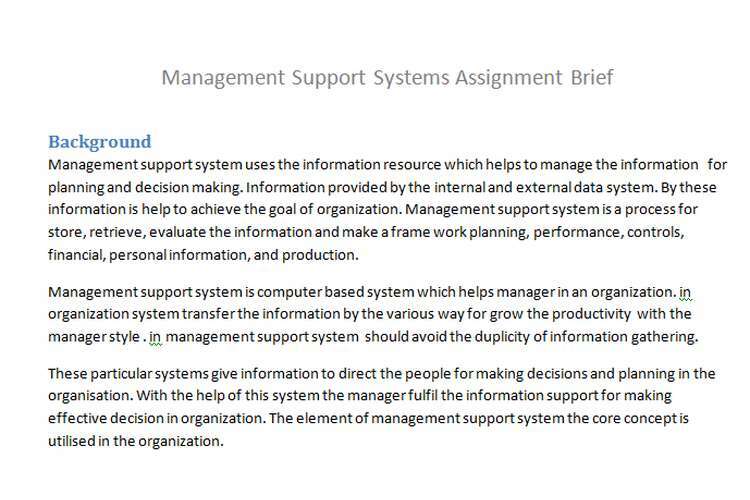 The element of management support system the core concept is utilised in the organization. Analyse the role of MSS within organisations. Analyse and evaluate the theories of decision-making and decision modelling. The dairy industry is one of the largest industries in New Zealand and in particular in the Waikato region. Management Support Systems are used in many aspects of the industry, for example - breeding, milk analysis, fertilizer management. Analyses the role of the MSS within the organisation. Analyses and evaluates the theory being used that underpins the MSS. Use the marking rubric provided. 1900-2100 words plus references and diagrams. OZ Assignment Help Australia provides best quality assignment writing service in affordable prices and we are providing most flexible assignment writing according to students need. these assignment help to achieve good grade.